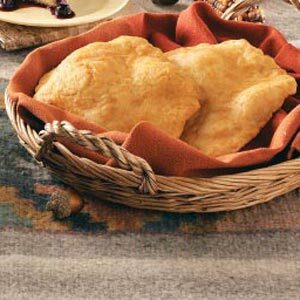 Alaskan fry bread is different than fry bread down south. Instead of being made with baking powder, water, flour and salt, it is made with yeast, flour, dry milk, water, salt, and usually some sort of sweetener. Just like a yeast bread recipe. Traditionally, I’ve seen it served hot with a drizzle of honey, or with jam made from local berries. Sprinkle yeast in the milk, let it set for a couple minutes to make sure the yeast is alive. If the milk gets a bit foamy, it’s alive. Slowly add the rest of the flour, when you can’t stir, knead it in. You might need a handful of ;four, more or less. After it rises, punch it down, and split the dough into 2, then each of those pieces in 2, then each of those pieces in 2. There should be 8 balls total. Roll the pieces into a ball shape and pat and pull them flat. Cut 3 or 4 lines through the dough and stretch it out slightly. Again, traditionally, Crisco is used because it keeps well, although some people like to use canola oil. When the oil is hot*, put in the dough, a couple pieces at a time. Fry until it’s golden on one side, flip over and fry the other side. When it’s golden on both sides, pull out and set to drain on a couple paper towels.